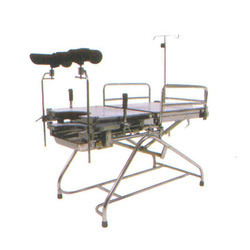 Offering you a complete choice of products which include labour delivery room bed (hydraulic), labour table, obestetric delivery bed in 2 parts 2 sections top and obstetric delivery table (3 sections). •S.S telescopic IV Rod with 4 hooks. • Tubularframe mounted on 125mm central locking castor. • ABS head panel & S.S tray. • Leg end section can slide under the main section. • Height adjustment through high quality hydraulic pump. • Overall size 1880Lx660Wx600-800H cms. • Back section adjustment through racnk mechanism. • SS IV Rod with 4 hooks. • Height adjustable a pair of foam padded knee crutches. • Frame made of S.S tube. • Overall approxsize 72" x27" x30". • Leg fitted with PVC Stamps. • 3 Section Top made of Bakelite sheet. • Back rest section adjustable crank mechanism from backend. • Supplied with waste collecting S.S Bowl on S.S bracket. Leg section on swivel castors with brakes. Height adjustable a pair of knee crutches. Approx. 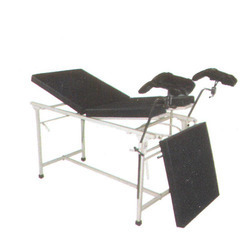 Dimension 72" Lx30"Wx30" H.
• Backrest, seat, leg section adjustable by hand lever. • Three sections cushioned top. 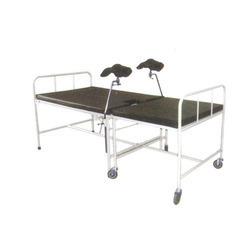 • Height adjustable a pair of knees crutches. • Approx. Dimension: 72" L x22"Wx30"H.
• Complete with SS bowls. 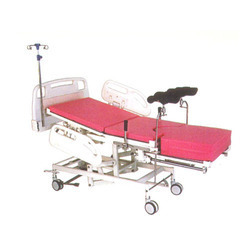 Looking for Delivery Beds ?